Cartoonists and satirists find great inspiration from maps and this often leads them to use, modify or base their own work on them. Maps give us such iconic shapes that we relate to instinctively. We most likely know the shape of our own country and also of those we are most familiar with. The shapes are unique and so they become symbols in their own right. The fact they then have a symbolic association means it’s very easy to attach other imagery to the shapes to create new work. This is often satirical in nature as national stereotypes are contorted into country shapes. There is a long tradition of cartoons being published in daily newspapers as a way to provide a commentary on the day’s events. Cartoonists are always seeking to entertain but to be clever in the juxtaposition of their work and some overarching political, social or economic message. Here, The Times’ cartoonist Peter Brookes goes to work on a theme that explores the Italian Mafia. The association with Sicily is clear and the narrative of the victim of Italy being dragged to a watery grave resonates as being stereotypical of the way some of the Mafia’s victims may have died. The political message is clear – the ongoing issues of the Mafia and their underlying involvement in politics is dragging the country down. It’s being shackled by the problems and drowning. It’s a very simple, clear message that commented on the state of Italian politics and the involvement of the Mafia at the time. 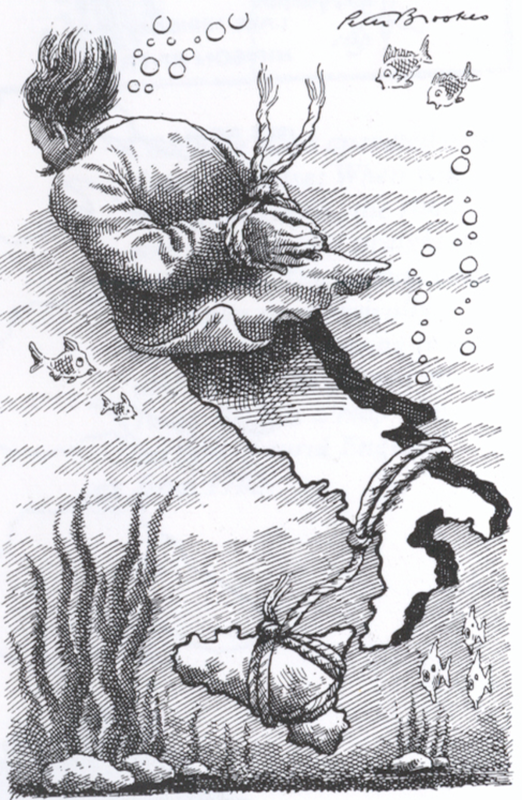 The fact that Italy is shaped like it is, that it is so recognisable and that Sicily could be used as a rock to drag the rest of the country down was a gift to Brookes. He took considerable artistic licence for the north of the country but you do not need the entire shape to make use of the important component of the southern half. The subdivision of the country is neatly handled by placing a jacket across the northern half and simply using the country as legs and feet. Having the imagination to see satire in graphical work and to incorporate maps into the design is not an easy task. Maps have many uses and as shapes in their own right they provide us with rich, unique symbology. This entry was posted in MapCarte and tagged cartoon, MapCarte, satirical by @kennethfield. Bookmark the permalink.